Edisto Island is one of South Carolina's Sea Islands, the larger part of which lies in Charleston County, with its southern tip in Colleton County. 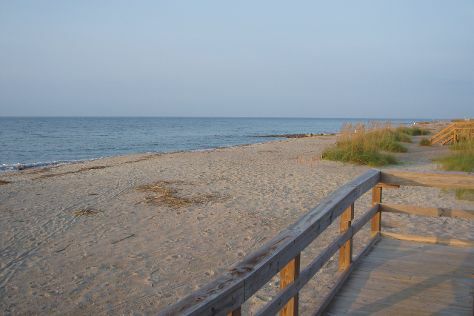 The town of Edisto Beach is in Colleton County, while the Charleston County part of the island is unincorporated.The island, town, and Edisto River are named after the historic Edistow people, a Native American sub-tribe of the Cusabo Indians, who inhabited the island as well as nearby mainland areas.HistoryIndigenous peoples often had fishing camps on the islands, using them seasonally. The historic Edisto people are known to have occupied the island as well as mainland areas and traded with the upcountry Catawba. The sub-tribe became extinct during the colonial period. The Wassamassaw Tribe of Varnertown Indians is a group of descendants of various tribes who intermarried and who have occupied a settlement between Summerville and Moncks Corner in Berkeley County, South Carolina. In 2005 they gained state recognition as an Indian group, one of six tribes to do so.The first tracts of land, called plantations, were granted on Edisto Island before 1700. Landowners first harvested timber and deerskins, planted indigo and some rice, and kept herds of free-ranging cattle to produce hides for the European market and salt beef for Caribbean plantations. Cotton gradually became the principal crop, and after the American Revolution, Edisto Island planters became wealthy and famous from their production of long-staple Sea Island cotton. The labor done by hundreds of enslaved Africans who developed the creole Gullah language and culture on the islands and in the Lowcountry, distinctive for its African traditions. Edisto Island is in Coastal South Carolina. Our United States visit planner combines visitor reviews with your personal interests to make an itinerary informed by experts, but tailored to suit your style.